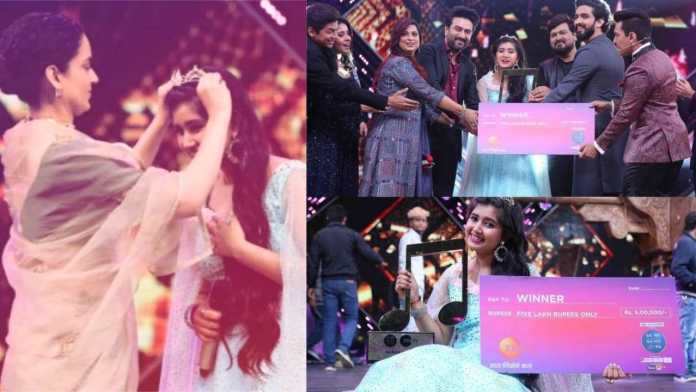 Sa Re Ga Ma Pa 2018 grand finale winner: Ishita Vishwakarma takes home the winning trophy! Ishita Vishwakarma on Sunday emerged as the winner of Zee TV’s ‘Sa Re Ga Ma Pa 2018’. Along with the winner’s trophy, Ishita Vishwakarma also took a home cash prize of Rs 5 lakh and a brand-new car. The Ishita Vishwakarma 16-year-old beat Sahil Solanki, Tanmay Chaturvedi, Aishwarya Pandit, Sonu Gill, and Aslam Abdul Majeed to win the coveted title. Tanmay and Sonu were announced as the first and second runner-up, respectively. Apart from Ishita Vishwakarma musical career, the young girl is keen to study further. “I am in my 11th standard now pursuing commerce. Post my schooling, I plan to take up music. While my mother always wanted me to pursue music, my father wanted his child to become a doctor. Though I love music, I want to fulfill my father’s dreams also. I will do a Ph.D. in music so that he gets to see the ‘Doctor’ title added to my name,” concluded Ishita Vishwakarma. The Sa Re Ga Ma Pa 2018 grand finale also saw performances by Sunidhi Chauhan and Ankita Lokhande. Hosted by Aditya Narayan, the season was judged by Shekhar Ravjiani, Wajid Khan and Richa Sharma.